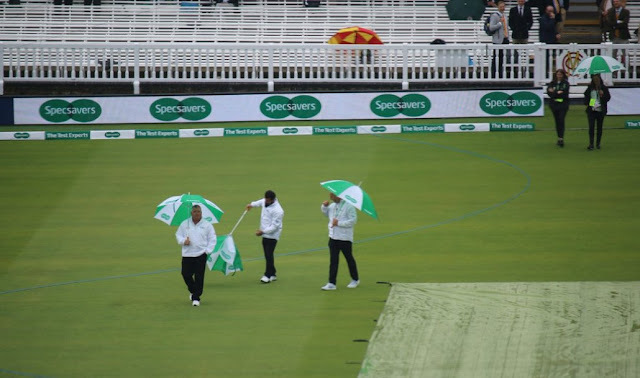 The 2nd Test of the present Series between England and India was to begin at Lord’s yesterday – people waited – and had to leave without watching a ball being bowled as day 1 play was abandoned due to rain. Lord’s is Cricket’s most valued ground ! …. Marylebone Cricket Club (MCC) is the world’s most active cricket club, the owner of Lord’s Ground and the guardian of the Laws of the game. Founded in 1787, it has been recognised as the sole authority on the Laws of Cricket since its foundation and it moved to its current home at Lord’s in 1814. There are 18,000 Full and 5,000 Associate Members of MCC. Those Members own the Ground and all MCC’s assets (the most famous of which is the Ashes Urn). MCC owns the most comprehensive collection of cricket artefacts and books in the world, housed in its Museum and Library at Lord’s. Lord's Cricket Ground, generally known as Lord's, is a cricket venue in St John's Wood, London. Named after its founder, Thomas Lord, it is owned by Marylebone Cricket Club (MCC). Lord's today is not on its original site, being the third of three grounds that Lord established between 1787 and 1814. The current ground celebrated its two hundredth anniversary in 2014. To mark the occasion, on 5th July 2014 a Marylebone Cricket Club (MCC) XI captained by Sachin Tendulkar played a Rest of the World XI led by Shane Warne in a 50 overs match. International cricket at Lord’s generates millions of pounds for the local economy, according to a study commissioned by MCC. Sachin Tendulkar was set to ring the bell to signal five minutes before the start of play on Day One of the second England v India Specsavers Test match at Lord’s on Thursday. Other former India internationals to ring the bell at a Lord’s Test are Sunil Gavaskar, The Nawab of Pataudi Jr, Dilip Vengsarkar, Rahul Dravid, Kapil Dev and Sourav Ganguly. In 1990, Tendulkar’s first Test match against England came at Lord’s, and he was made an Honorary Life Member of Marylebone Cricket Club (MCC) in 2010. For day two, Ted Dexter would l ring the bell which is located outside the Bowlers’ Bar of the Lord’s Pavilion. The bell is rung to signify the imminent start of play, and it has become a great honour to be invited to ring it on the morning of a Test match. Lord’s is very close to the centre of London – just under 1 mile from Baker Street – and easy to reach by road, tube and bus. St John’s Wood is the closest tube station (approximately 5 minutes’ walk), and Baker Street, Warwick Avenue, Marylebone and Edgware Road are all within 15 minutes’ walk. Portion of Lord’s, the iconic cricket ground in England, is up for sale, at just £500 or around Rs 45,000! The piece of land that is up for grabs is the unused tunnels underneath the Nursery End at the famous cricket ground, which will make one a token owner of the Mecca of Cricket. These tunnels were brought by property developer Charles Rifkind in 1999 when Marylebone Cricket Club (MCC) failed to retail them in an auction. The MCC has rented the top surface from Rifkind, ever since, which has been subjected to a lot of negotiations over the past 19 years. Rifkind wanted to develop two blocks of luxury residential flats in collaboration with the MCC on the Nursery Ground behind the spaceship-shaped media centre of Lord’s, but MCC members voted against it – followed by which New Commonwealth, chaired by former English Cricketer David Gower, decided to spread the ownership of their land around the world. Supporters of four-day Tests could feel gratified, even if nobody else was, when the opening day of the second Test was abandoned without a ball bowled. England’s inaugural Test against Ireland at Lord’s next July is scheduled to be England’s first four-day Test, but this one against India is now a four-dayer in effect. The shorter the game, the more superfluous a second spinner becomes as the pitch has less scope to wear and tear, though these hours of play have been extended by half an hour (to 6.30pm), and the number of overs from 90 to 98. And as the captains never came close to tossing, both England and India can revise their teams to suit conditions – and any chance Moeen Ali had of playing instead of Chris Woakes has receded further. Likewise, on a pitch that will be damp after a day under covers, India are less likely to play a left-arm spinner. Bowling first, especially under cloud-cover, with the four pace bowlers they had at Edgbaston, would be India’s quickest way back into this series against an England side containing the debutant Ollie Pope at number four. Guardian writes that it is a shame this is not England’s 1000th Test but their 1001st. MCC do these celebrations rather well; at any rate, if the ceremony had been at Lord’s, they would have amounted to more than the presentation of two plaques before the start, as at Edgbaston. A parade of former England Test players, or at least of the former captains, would have been some compensation for the full house that endured a day of rain. It was the first washed-out Test day at Lord’s since 2001 and left MCC to refund about £2 million worth of match-day tickets. Rain insurance will cover the cost of refunds, and the bars were busy all day, so the financial loss will be relatively small. Strangely, the England player who had the best day may have been the one who was dropped for Lord’s, Dawid Malan. He has lost his Test place, but he has yet to play for England in his most successful format of 50 overs – and there is a possibility that England will have one or even two vacancies in their ODI team for the World Cup. So as one door closes, another opens, and it is possible that England’s World Cup squad – even their team – could contain two Middlesex left-handed batsmen in the captain, Eoin Morgan, and Malan. Lord’s experienced its first washout of a day of Test match cricket play since 2001 on Thursday leaving the MCC to refund around £2m worth of matchday tickets. Rain insurance will cover the cost of refunds - Both captains will name their teams on Friday and the weather may well have changed their plans. The damp conditions will probably persuade England to play one spinner in Adil Rashid leaving Chris Woakes clear to resume his Test career after injury in place of the absent Ben Stokes. India are likely to drop opener Shikhar Dhawan and replace him with Cheteshwar Pujara, who will bat at three. KL Rahul will move up to open with Murali Vijay. Vividly remember that summer tour in June 1986 when Kapil Dev led us to a victory in the 1st Test at Lords. It was India’s first Test victory at Lord's and only their second in 33 Tests in England. It started well for England – RT Robinson got out to Maninder making 35 with score at 66; Gooch made 114 and Pringle 63 as England were all out for 294. Chetan Sharma took 5/64; Roger Binny 55/3 – while Kapil dev who bowled so well ended up 1/67. India replied strongly with Mohinder 69, Dilip Vengsarkar 126 – totalling 341. In the 2nd innings England were shot out for 180 – Kapil taking 4 and Maninder Singh 3. The target of 134 was achieved losing 5 wickets. Kapil was the Man of the match – a good match for Chetan Sharma, who is otherwise remembered for that one delivery at Sharjah to Minadad.